Whether Georgia becomes the next Ukraine or remains a non-aligned state will largely depend on the West. Still struggling to combat the strategic pressure on its eastern border, Russia is quickly moving to shore up its influence in the South Caucuses by strengthening its hold over its protectorates Abkhazia and South Ossetia. Both territories have been dependent on Moscow for strategic and financial support since they won wars of secession against Georgia in the early 1990s. However, it wasn’t until after Georgia’s failed attempt to recapture the territories by force in 2008 that Russia formally recognised them both as sovereign entities. Russia’s victory in that conflict brought Georgia’s ambitions to join NATO to an indefinite halt, but there have been signs in recent months that the West is again looking for rapprochement with Russia’s estranged neighbour. Keen to avoid a repeat of the 2008 conflict or Ukraine type conflict in Georgia, Moscow is taking preemptive steps to counter Georgia’s Western ambitions by pulling Abkhazia and South Ossetia into closer orbits. In late 2014 Russia signed an alliance treaty with Abkhazia and is due to sign a similar agreement with South Ossetia. On Monday November 24th in Sochi, Vladimir Putin and his Abkhaz counterpart, Raul Khadzhimba, signed an “alliance and integration” treaty. This comprehensive deal entails enormous benefits for the black sea enclave whilst entrenching its status as Moscow’s protectorate. Under the treaty, Russia guaranteed US$200m of aid to Abkhazia in 2015 and promised subsidies amounting to US$270m over the next three years. Moscow also agreed to increase pensions and other social services Abkhaz citizens. Finally, whilst still symbolically recognising Abkhazia as an independent state, Russia has incorporated Abkhazia’s army into a joint military force that will operate under the command of a Russian general. Russia also agreed to modernise Abkhazia’s army and assist with the strengthening of Abkhazia’s border with Georgia. Though the treaty comes as little surprise to students of Russian foreign policy, the negotiation process reveals a great deal about Moscow’s aims for the region. Negotiations began with Russia sending a draft document through diplomatic channels to the Abkhaz government. Russia expected a reviewed document to return via the same channels but instead, the entirety of the document was published in the state run Abkhaz newspaper. In its unedited form, the treaty stipulated that Abkhazia’s military be completely incorporated into Russia’s and that Russian customs take full control of the Russia/Abkhazia border. More importantly, the the draft treaty included measures that would allow Russians to easily attain Abkhazian citizenship. This would have led to an influx of Russian migrants and eventually made the ethnic Abkhaz a minority inside their territory. Thus, this provision would have slowly transformed Abkhazia from a quazi-independent state to a de facto province of Russia. Signing the original treaty would have been political suicide for Abkhazia’s president, Raul Khadzhimba, who was elected last August on a platform of anti-authoritarianism and protecting Abkhazia’s sovereignty. Knowing that he was unable to resist Moscow at the negotiating table, Khadzhimba gambled on leaking the document, hoping that it would be so unpopular as to create a situation where it couldn’t be signed without starting a civil war. This unconventional approach to diplomacy paid off, with the Abkhaz public mobilising against the proposal to allow Russians to gain citizenship and Khadzhimba was successfully able to have this provision removed from the agreement. 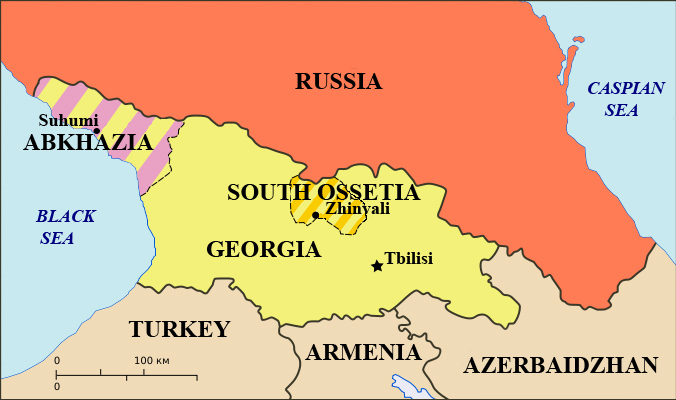 What’s in store for South Ossetia? Shortly before the signing of the treaty with Abkhazia, Russia announced its intention to establish a similar relationship with its other protectorate in the region, South Ossetia. When Russia’s treaty with South Ossetia is signed in the coming weeks, it is more likely to resemble Russia’s original proposed treaty with Abkhazia than the final version. Firstly, this is because South Ossetia’s political elite remain more loyal to Moscow than their Abkhaz counterparts do. South Ossetia’s leader Leonid Tibilov said on December 10 that the treaty could lead to part of South Ossetia formally joining Russia. Secondly, public opinion in South Ossetia is much less likely to be hostile to the idea of formally joining Russia than the Abkhaz were. Russian troops have had a strong presence in the territory since the 2008 war and have been helping the Ossetians patrol the Georgian border. On February 18, a preliminary agreement was signed between Russia and South Ossetia to finally settle the border between the two territories. So why is Moscow intent on drawing Abkhazia and South Ossetia into a closer orbit? And why now, given that Russia could have struck very similar deals at any other time since 2008? The answer is that Russia is putting pressure on Georgia. Georgia is a strategically crucial state crossed with pipelines that carry oil and gas from the Caspian sea to Europe. It also has access to the Black Sea, which Russia is keen to control. Most importantly, Russia is trying to deter Georgia from strengthening its alliance with the West and prevent it from ever attaining membership of NATO. In other words, Russia is taking preemptive measures to ensure that a repeat of the Ukraine crisis does not erupt on it’s Caucasian border. Since the overthrow of Eduard Shevardnadze’s regime in the 2003 Rose revolution, Georgia’s political elite have been loyal partners of the West and intent on attaining NATO membership. Though the 2008 war briefly dampened the West’s zeal for rapprochement with Georgia, the EU signed an association agreement with Georgia last June. Around the same time, NATO also announced that it hoped to open a training center in Georgia by the end of 2015. Then this January NATO Deputy Secretary General Alexander Vershbow said Georgia was moving forward on its path towards membership of the organisation. Drawing Abkhazia and South Ossetia closer to Russia’s orbit is the Kremlin’s way of trying to block this outcome. It is hard to see that Georgia would be incorporated into the alliance whilst its sovereignty does not extend to two enclaves that together account for almost 20% of the country’s area. For Georgia to be incorporated into NATO, it will either have to retake the territories by force or acknowledge their independence. Even this latter option may not be enough; no Western leader would want to acknowledge the independence of Abkhazia or South Ossetia for fear of being branded an agent of Russian “imperialism”. By shrewdly staggering the negotiation of the two treaties, Moscow is hoping to make this a lasting political issue in Georgia and destabilise the Georgian government. The signing of the treaty with Abkhazia has already caused a stir in Georgia. Pro-Russian elements of the population have stepped up their criticism of the government for provoking Russia with its pro Western policies. Meanwhile, tens of thousands of members of the pro-Western United National Movement (UNM) gathered in Tblisi to protest Russia’s “annexation” of part of Georgia. Just how long Russia drags out its negotiations with the South Ossetians depends on how much of a stir they are able to cause in Georgia by doing so. However, don’t expect a second Rose revolution any time soon, the Georgian government has too many powerful supporters in the West to be toppled so easily. Whether Georgia becomes the next Ukraine or remains a non-aligned state will depend almost entirely on Western policy. Suivant European firepower for Arab muscle-power?